Their has been a Fort Wayne Komets franchise in minor league hockey since 1952. That's an incredible run for any minor league sport. Teams and entire leagues have come and gone, but Komets hockey has endured. The current team in the ECHL is actually the third incarnation of the Komets. The original franchise joined the IHL in 1952 as an expansion franchise. They played their home games at the Allen County War Memorial Coliseum, which opened in 1952 and originally held 8,103. Ken Ullyot coached the Komets in 1962-63. That year's squad won a hotly contested regular season title, going 35-30-5, just a point ahead of Minneapolis and two ahead of third place Muskegon. The cover picture is from the postgame celebration in Omaha. The Komets hammered the Knights, 7-1, to win the team's seventh league title in 11 years! Fort Wayne was third in the league in scoring, with 283 goals. Pacing the Komets attack was Len Thornson, with 32 goals and 115 points. Eddie Long led the team in goals with 56, second in the league. Three other players scored at least thirty, and two others hit the 20-goal mark. Fort Wayne allowed the second-fewest goals in the league that year, a measly 255. This was the era of "one goalie per team", and Chuck Adamson was between the pipes for all 70 Komets games and the postseason. Ken Ullyot's Komets would not disappoint in the playoffs. They drew the Muskegon Zephyrs in Round One, and advanced in six games, despite being equaled in goals by the Zephyrs, 28-28. 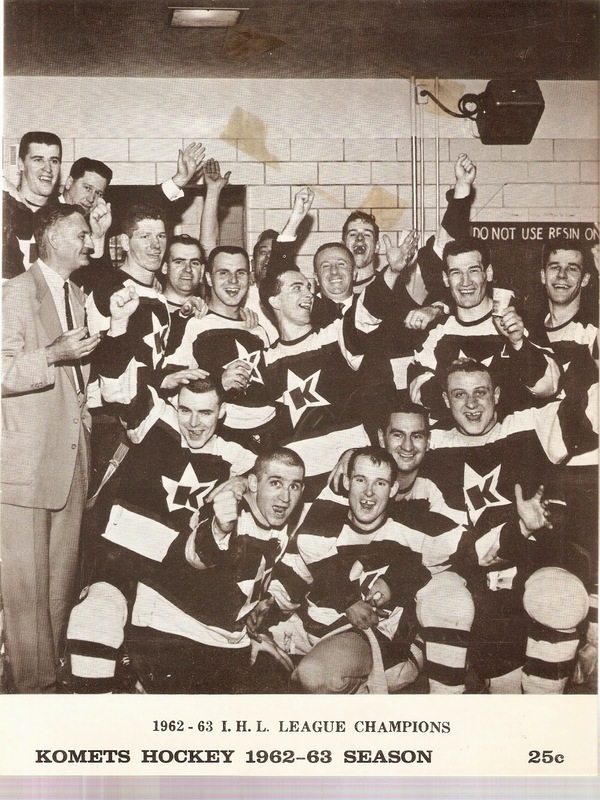 Fort Wayne then met the Minneapolis Millers in the Turner Cup Finals. After splitting the first two games in Fort Wayne, the Komets then took the next three games to capture their first Turner Cup title. This is the oldest Komets program I have been able to snag on eBay. There's not much to it, just 14 pages of black-and-white pictures and ads. The ads include WGL News 1250 AM, The Embers Supper Club and Magnavox Electric Organs. There's also a small bio on announcer Bob Chase, who was then in his ninth season with the club. Chase still calls Komets hockey on WOWO 1190, and won the ECHL's Broadcaster of the Year award this past season! In short, he's the Ernie Harwell or Vin Scully of minor league hockey. This program also came with two ticket stubs from "Game A" of the playoff series against Muskegon. I'm guessing that's Game 1, which the Zephyrs won 7-4 on March 30th.